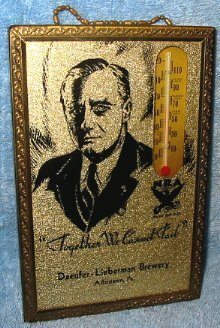 Thermometer – Daeufer thermometer featuring FDR and the NRA logo. Scarce and 30’s or early 40’s vintage. “Thermoplak Made in USA by Brown & Bigelow St Paul Minn” stamped on back. Measures 4 x 6 inches and in great condition. Thermometer in working order. Appears it “may” read a few degrees higher than actual temperature.